It is not an ordinary unijunction Transistor. But the V-I characteristics is almost similar to an ordinary ujt. Programmable ujt is a four layer P-N-P-N device with a gate connected directly to the sandwiched N-type layer. 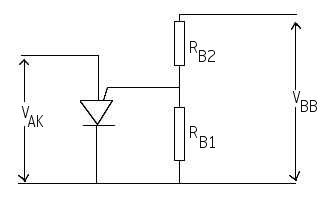 The term "Programmable" is applied because the interbase Resistance Rbb, the intrinsic stand off ratio and peak point voltage Vp as defined in UJT can be programmed to any desired values through external base Resistors Rb1 and Rb2 and the supply voltage Vbb. 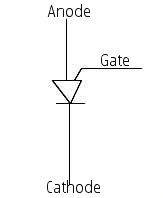 Figure indicates that the anode-gate Junction is Forward biased when the anode becomes positive with respect to gate. When this occurs, the device is turned ON. The anode to cathode voltage Vak then drops to a low level, and the device conducts heavily until the input voltage become too low to sustain conduction. It is seen that this action stimulates the performance of a UJT. The anode act as Emitter ofthis unijunction Transistor. PUT, because of its superiority over ordinary unijunction Transistors, replaces UJT. PUT is popularly used for Relaxation Oscillators.